This investigation was designed originally as a case study which included data analysis on other ethology studies. To shorten the lab and to align with the AP Biology, this version includes a chi square analysis and can be completed in about an hour. Students will need to gather pillbugs (isopods) from their yards or the school grounds, so this experiment is best done in the spring or fall, though you can maintain a colony of isopods fairly easy. Fun fact: there are actually two separate species of these crustaceans in the midwest, one that curls into a ball, which is sometimes called a rolly-polly, and a more streamlined isopod that does not ball up. Observant students will often notice this and adjust the experiment to only include one type. Students run multiple experiments to determine if pillbugs exhibit negative or positive taxis or kinesis. The instructor can provide various chemicals to test (lemon juice, baking soda, glucose, alcohol) and choice chambers can be purchased or built by students. I have had very mixed results on any of the chemicals, with sample sizes often being too small to confirm results, though this serves as a discussion by itself. HS-LS1-3 Plan and conduct an investigation to provide evidence that feedback mechanisms maintain homeostasis. 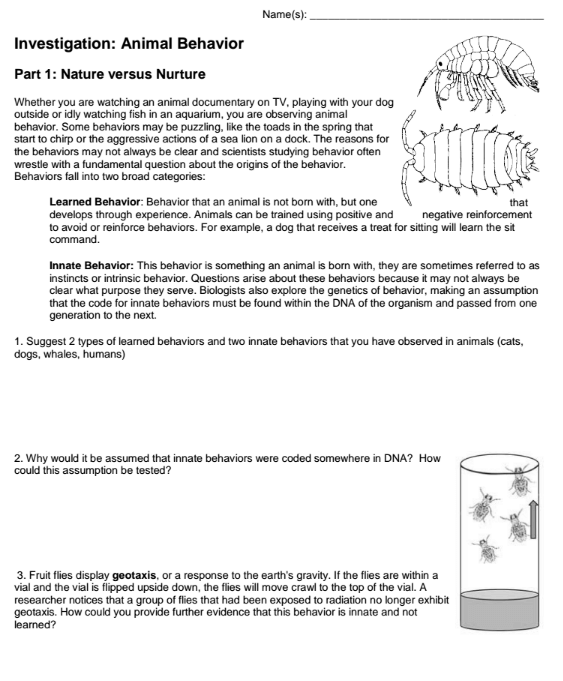 HS-LS2-8 Evaluate the evidence for the role of group behavior on individual and species’ chances to survive and reproduce.